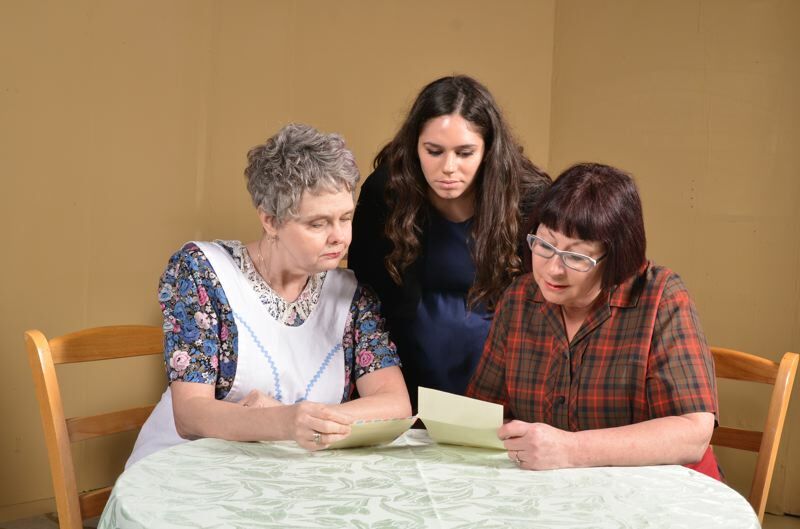 Sandy Actors Theatre will present its latest historical fiction until Feb. 18. You don't have to be wearing rose colored glasses to see that Sandy Actors Theatre's latest production truly delivers. The four-person cast performing "Rose Colored Glass" by Susan Bigelow and Janice Goldberg work seamlessly together to tell an all-too-familiar story of intolerance and loss, but also one of love and friendship. As the lights illuminate the stage, one is faintly reminded of the opening lines of Shakespeare's Romeo and Juliet: "Two households, both alike in dignity in fair Verona, where we lay our scene. From ancient grudge break to new mutiny." Except, of course, our play is not set in 1300s but the 1930s, and is not taking place in fair Verona, but pre-Pearl Harbor Chicago in the backrooms of two businesses separated by an alleyway. Nevertheless, the idea of an old grudge giving way to new friendship is present, as Irish catholic bar owner Lady O'Riley's granddaughter Peg (Tracy Rodriguez) mischievously unites her grandmother and neighboring Austrian Jewish delicatessen owner Rose Fleishman around the task of retrieving Fleishman's nephew from Austria, now under Hitler's rule. Both Laura Reeves (O'Riley) and Francine Raften (Fleishman) play convincingly stubborn-yet-emotional characters. Originally separated by a feud of pride between their two, now-late husbands, the women are hesitant to befriend each other, but Peg's meddling proves influential and soon the two are scheming and struggling together to cut through all of the bureaucratic red tape involved in extracting Fleishman's nephew from Europe. When first learning of Fleishman's problem, O'Riley has the mindset that many Americans are said to have had before World War II came knocking on the United States' doorstep: indifference. "Rose, Europe is so far away," she says. "It's not our problem." For many living in the U.S., this was the belief. There was no war because it wasn't directly affecting them. But for people like Fleishman, who had misplaced family still living in Europe and being punished for their religion, it was all too real. "This play is such a mirror image of what's happening today," Director Megan Grassl told The Post in an earlier article. "We still have troops over in Afghanistan, and you could probably take someone off of the street today and they might not even know. The play touches on a cultural difference." Grassl explained that the play appeals to her because of its unique view of the second world war. "This play is different from other World War II plays," she said. "It is such a different angle. We're seeing it from the side of the U.S. It's a different type of struggle that happened a lot." Although the play is a strong story of friendship, there is unfortunately no happy ending, which was the reality for many people during that time. Regardless, it is a great and productive way to spend an evening and possibly even gain some perspective. The play will run through Feb. 18 with shows at 7:30 p.m. Fridays and Saturdays and at 3 p.m. on Sunday. Tickets for the family-friendly show are $18 for adults, $15 for students and seniors. What: "Rose Colored Glass" by Susan Bigelow and Janice Goldberg. When: Fridays and Saturdays at 7:30 p.m. and Sundays at 3 p.m. through Feb. 18. Where: Sandy Actors Theatre, 17433 Meinig Ave., Sandy. Cost: $18 for adults, $15 for students and seniors. Tickets available online at sandyactorstheatre.org.